Add a valuable dimension to your Canadian education experience. When you choose homestay with CHN you become a member of the family you live with and part of the community you live in. We are delighted that you are thinking of visiting us. There is a lot to discover and enjoy in our country. We can help you make your experience here full of happy memories. by reducing ignorance, fear and prejudice. CHN hosts are carefully screened, including reference checks, criminal record checks and interviews. CHN’s application and matching process helps pair students to the right host. You are never alone! CHN provides students and their hosts with 24/7/365 first-language support. CHN fees are less expensive than on-campus options and often include meal plans and amenities like wifi. Your homestay hosts will include you in meaningful family time including meals, conversations and excursions. Studying in Canada? Make sure you have the right travel documents. to stay in close contact for the duration of your visit in Canada. Our promise is good for everyone in the CHN Homestay Program. It means our clients arrive in Canada to a supportive home environment, and are offered assistance at every stage of your visit in Canada. After their visit, many of our hosts and their students remain friends for life. Send you documents about Canadian culture and the keys to successful experience in homestay. Provide 24-hour support to you, in the event of an emergency. Because fees and services vary in regions across Canada, please contact studentinfo@canadahomestaynetwork.ca for information based on your study and accommodation requirements. All of our accommodations are located in appealing, safe neighborhoods accessible to your school or workplace by public transportation. At CHN you can choose accommodations to suit your budget. ALL of our hosts meet our high standards for safety and cleanliness. A quiet place to study, usually in your own room. Please note: special requests (like dietary restrictions) will be taken into consideration. Breakfast is defined as typical breakfast items in regular portions such as: cereal, toast, juice, coffee, bagel, eggs, fruit or yogurt. Half board does not include taking food or snacks from the home to consume at school or while out socializing. Student would only receive breakfast from the host (typically consisting of breakfast items) in regular portions such as: cereal, toast, juice, coffee, bagel, eggs, fruit or yogurt. Access to kitchen and refrigerator storage shelves and cooking facilities are expected, for foods students purchase and prepare for themselves. Students are responsible for cleaning the kitchen after use. 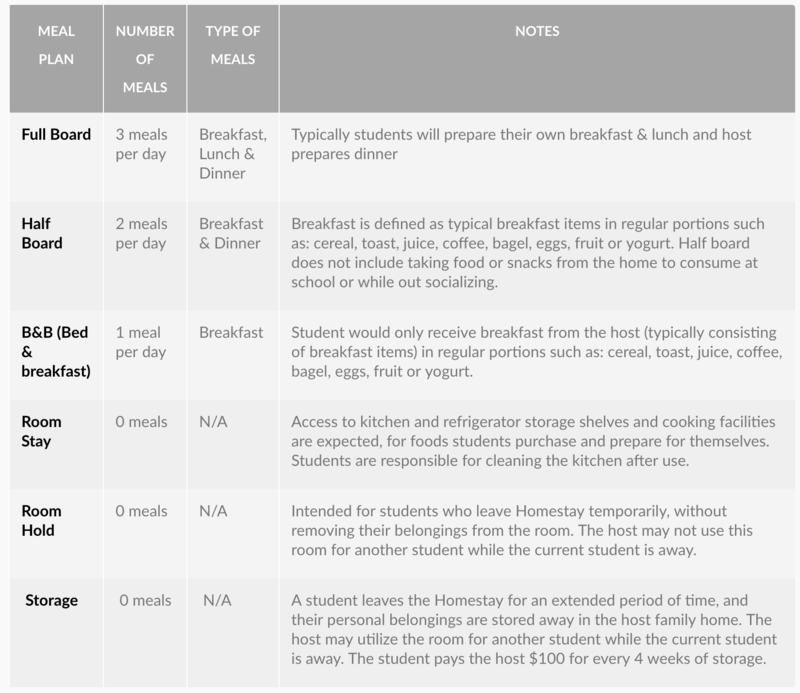 Intended for students who leave Homestay temporarily, without removing their belongings from the room. The host may not use this room for another student while the current student is away.